Micro-Tyco is the exciting new concept from WildHearts. Its vision is nothing less than the ignition of the spirit of enterprise across our whole culture, from our leading corporates to our universities, secondary and primary schools, and even nurseries. It is an enterprise challenge that brings our whole society together, reconnects us to one another, to what really matters, and compels us to collectively raise the bar in what we believe is possible for ourselves and our culture. Last year UWs was the only university invited to participate in the pilot challenge. This year a number of Scottish Universities are taking part as well as teams from nursery and primary schools, businesses and community groups. Sandra Hill, senior lecturer with the Business School, is looking for teams of students (and staff) to take part in this year’s challenge. An application form and flyer is attached. Staff in the Business School at Hamilton have already got a team together. Why not take on the challenge! Working for London 2012 is your chance to share a moment of history – not just in the UK, but on a global stage. The London 2012 Olympic Games and Paralympic Games are taking place in London and across the UK next summer, and they need talented and dedicated people to be a part of them. There are all sorts of job opportunities for all sorts of people. More than 100,000 people will be paid to work on the Games, all of them with different backgrounds, skills and experiences. From catering to IT, cleaning to ticketing, there are a wide range of paid roles. Recruitment is underway and if you’re keen to get involved you will find something you can apply for. 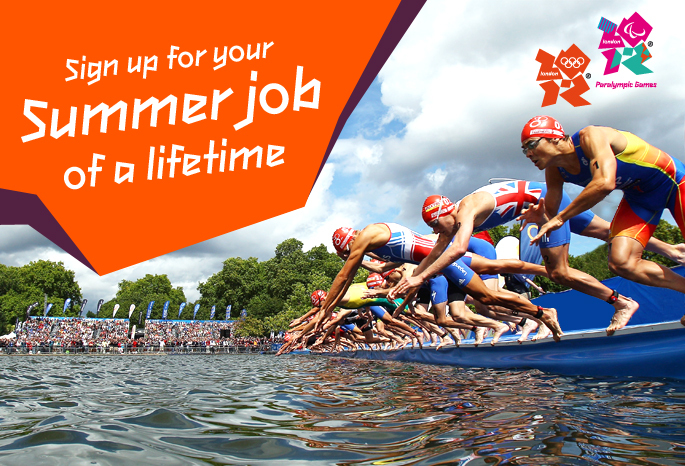 Visit http://www.london2012.com/jobs for more information and to register your interest. Posted in Work Experience. Bookmark the permalink. The Scottish Graduate Fair is the highlight of the recruitment season. Now in its 22nd year, it is the biggest graduate, postgraduate and internship recruitment event in Scotland attracting over 4,000 students and graduates of all disciplines and approximately 100 graduate employers and postgraduate recruiters. Students and graduates from all universities are welcome to attend. Posted in Miscellaneous and tagged graduate recruitment, Scottish Graduate Fair. Bookmark the permalink. Meet top graduate employers such as HP. Santander, Molson Coors, Jaguar Land-Rover, Bloomberg, The Civil Service, ExxonMobil and many more. Also watch out for news of the Scottish Graduate Recruitment Exhibition in Glasgow. Posted in Miscellaneous and tagged Careers Fair, graduate recruitment. Bookmark the permalink. Registration for Civil Service Fast Stream Graduate Programme 2012 is Open Now! The Civil Service Fast Stream is a talent management programme for graduates who have the potential to become the future leaders of the Civil Service. It is ranked in the top ten in The Times Top 100 Graduate Employers. Registration opened on 19th September and the general schemes close on 30 November; some of the specialised ones close earlier. For more information, check out the Fast Stream site, or look at the Prospects entry on Faststreamers. If you’re looking for a graduate job in engineering, there are some great opportunities available now for you to explore – but hurry, because they close soon. Ford is recruiting graduates to join its team of product developers and supplier technical assistance engineers, and also offers a range of other programmes. Closing dates are next week, and the same goes for graduate roles with Mott MacDonald, Explore Learning, Enterprise Rent-A-Car and Schneider Trading Associates. 19 September is the closing date for a range of graduate schemes with Ford, covering areas ranging from information technology to engineering. 23 September is your last chance to apply for the graduate hydrologist role with engineering consultancy Mott MacDonald, based in Cambridge. 27 September is the deadline for the graduate assistant director role with Explore Learning, a national network of tuition centres for 5 to 14 year olds. 29 September is the closing date for the Enterprise Rent-A-Car enterprise management training programme in areas across England. 30 September is the deadline for Schneider Trading Associates’ graduate trader programme. It’s also the closing date for the graduate opportunity for a knowledge base scientist with the educational charity Lhasa Limited. Posted in Miscellaneous and tagged Education, Engineering, graduate recruitment, Management. Bookmark the permalink.